With over 200 million users and 2.7 million business pages, LinkedIn is the ultimate platform for creating business connections, search for jobs and find potential clients. This guide will provide useful information to developing a strategy and execution plan for your LinkedIn prospecting. 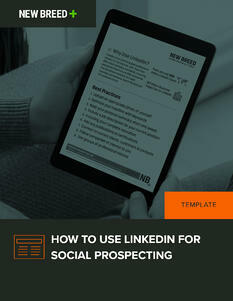 To get your free LinkedIn prospecting guide, fill out the form!